The PADI Seal Team is for young divers who are looking for an action-packed, adventurous program filled with exciting scuba "AquaMissions." Have you ever wondered what it's like to dive with flashlights, take pictures underwater or float effortlessly like an Astronaut? If you have, this is your chance to explore these exciting adventures in a swimming pool. As a PADI Seal, you learn the basics of safe diving and explore different AquaMissions - or specialty dives - like wreck, navigation, buoyancy, underwater photography, environmental awareness and more. Here's your chance to explore cool AquaMissions, meet friends and share in the adventure of the underwater world. And best of all - join a winning team - become a PADI Seal Team Member! 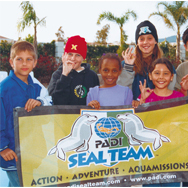 Contact the shop to learn more about the PADI Seal Team program and other options for youths and scuba diving.